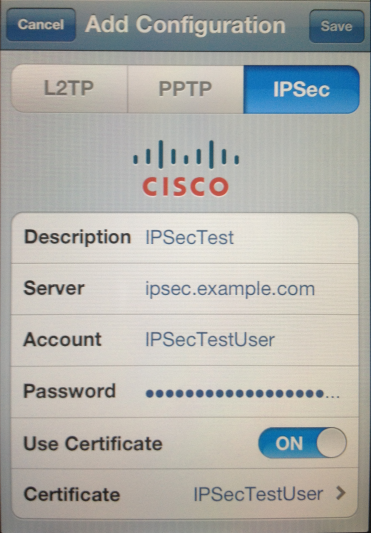 This how-to will explain how to configure IPSec VPN with RSA + Xauth authentication and iOS client device. Steps are pretty detailed so people with little pfSense and/or IPSec experience should be able to follow them without too many issues. The setup was tested on virtual machine running pfSense v2.0.1 and iOS v5 device. Go to 'System -> Cert Manager -> Certificates' and click on 'add or import ca' icon. NOTE: Common Name must be set to the domain or IP address that will be used to connect to the server. 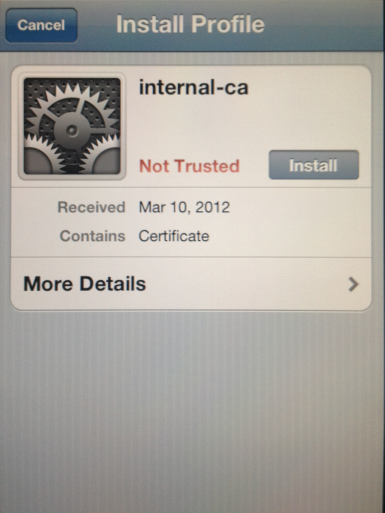 If you set it to something else iOS will refuse to connect to the server with message 'Could not validate the server certificate'. Message will be displayed on the top of the page with a button to create phase 1 entry, click on that link. At this point we are done configuring IPSec. Now we need to configure firewall to allow incoming requests. Warning: This will allow IPSec clients to reach your LAN as well as Internet addresses. 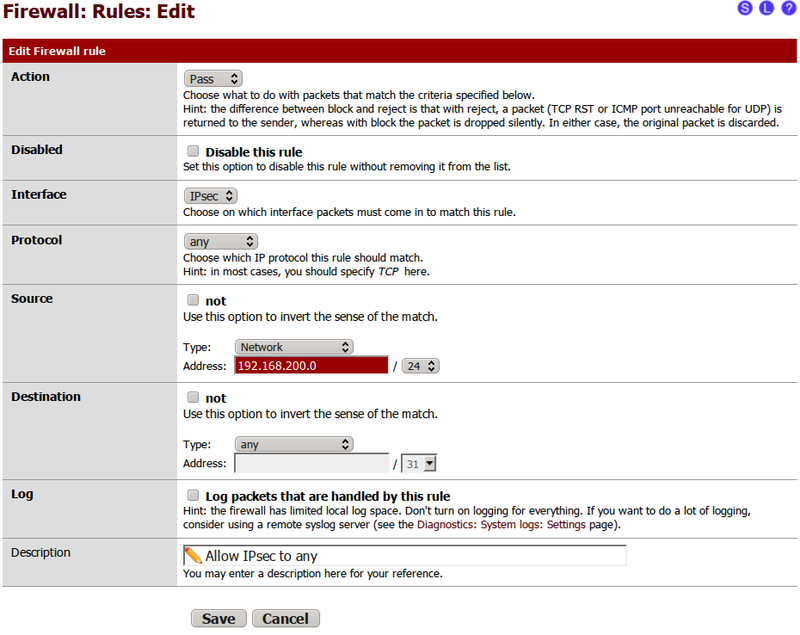 If that is not desired make sure you add blocking rules that restrict IPSec client access accordingly. If you do decide to block IPSec access to LAN you have to enable access to port 53 (DNS) on LAN interface because we specified LAN address as DNS server in step 5. 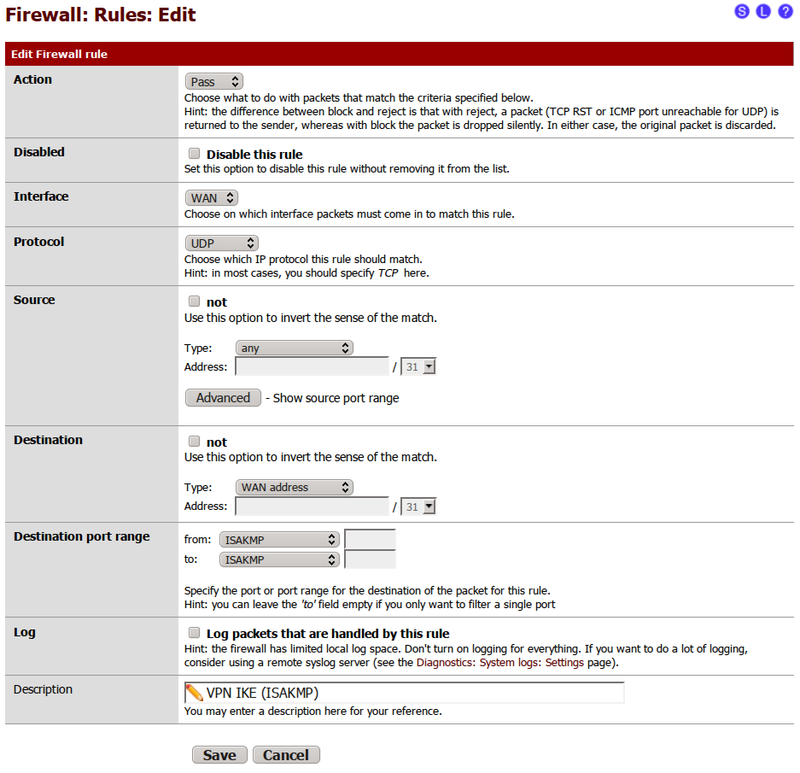 Hit 'Save' and then 'Apply changes' button on the top of the page in order for the firewall rules to take the effect. Click on 'add user' icon. Now hit 'edit user' and add 'User - System - Shell account access' privilege to effective permission list. If user is not given this permission it will not be able to authenticate. We have now finished configuring IPSec, firewall and user and can move on to configuring client device. Go to 'System -> Cert Manager -> CAs', click on 'export ca cert' icon and save .crt file. 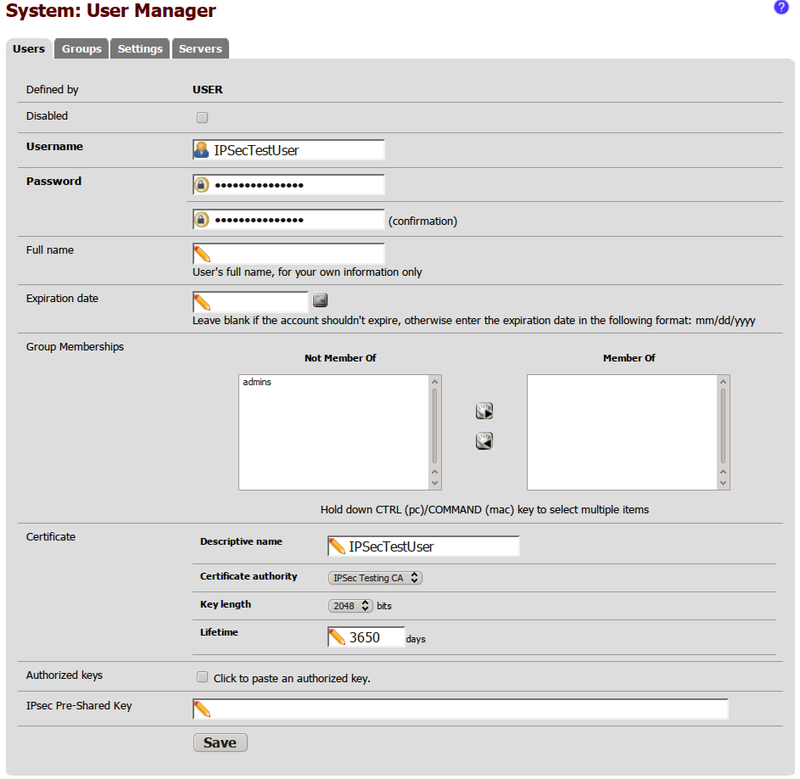 Go to 'System -> User Manager -> Users' and click 'edit' next to your user. In the 'User Certificates' section click on 'export private key' and 'export cert' icons and save .crt and .key files. In order to import user's private key and certificate into iOS we need to combine those two files into one single file. We will be doing that using OpenSSL. Run following command in the folder where you saved user key and certificate files. In the command above 'IPSecTestUser-IPSecTestUser.crt' is user certificate file, 'IPSecTestUser-IPSecTestUser.key' is user key file and 'IPSecTestUser-IPSecTestUser.p12' is the output file. Important: when OpenSSL asks to provide export password - do not leave it blank. iOS does not permit importing private keys that are not password protected. In order to achieve this you need to email CA's certificate file and user's certificate/private key .p12 file to an email that you can access from your iOS device. 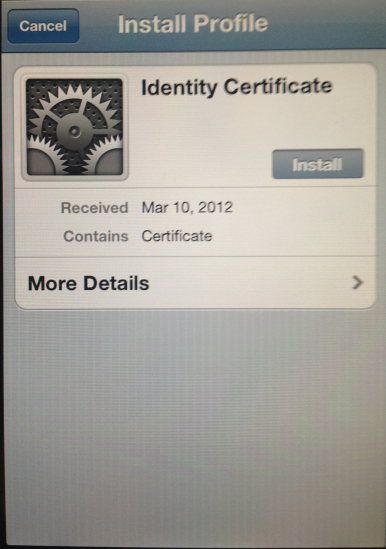 Once you open the email on iOS device click on the CA's certificate first. On the next page click 'Install' button. Repeat with the user certificate. 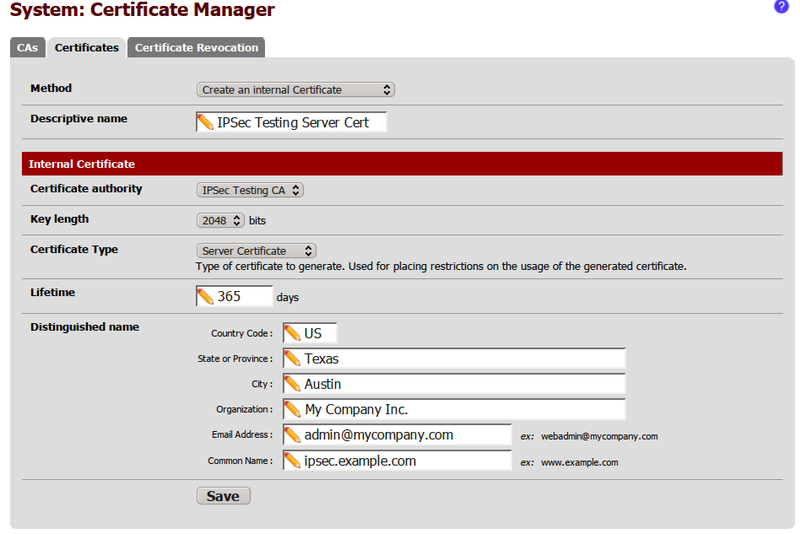 NOTE: server must match what you entered in the common name field when creating server certificate in the 2nd step of part 1. After saving configuration you can select it from the list and click on On/Off switch at the top of the page ('Settings -> General -> Network -> VPN'). If iOS is able to connect you will see VPN icon next to 3G/Wifi icon on the top of the screen. 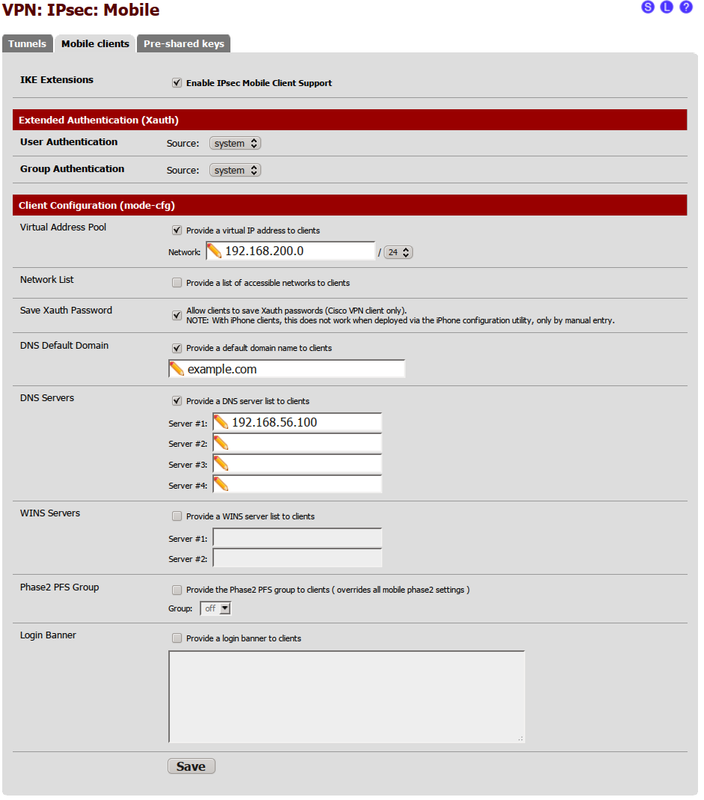 On pfSense box you can view VPN tunnel details on 'Status -> IPSec'. Configuration described in this guide can be further tweaked to meet your specific requirements. You could use different encryption algorithms to possibly increase the connection speed or route only traffic destined to specific network through VPN, letting all other traffic be routed via regular 3G/wifi connection. iOS also supports VPN-on-demand which allows you to automatically establish VPN when user tries to access specified domains. Thank you so much for sharing your solution with us!!! 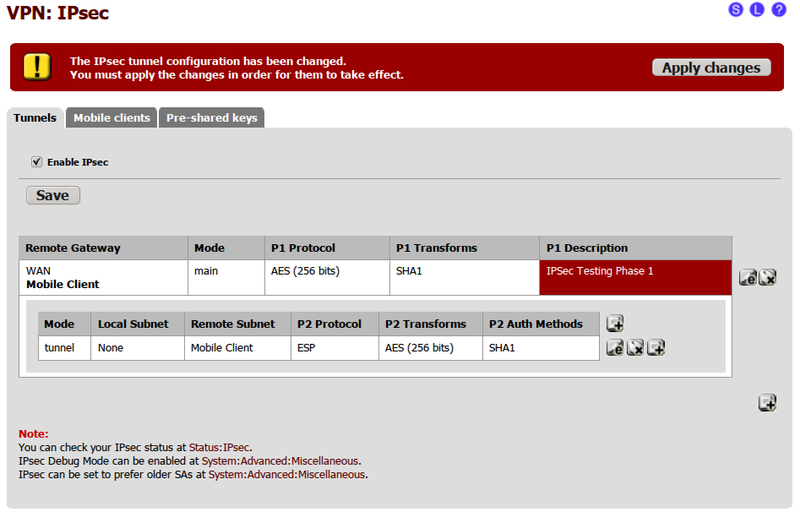 Your settings doesn't work for me (pfSense with fixed IP - iPhone iOS 5.0). The last log entry is "racoon: INFO: Adding remote and local NAT-D payloads." If I leave the password field in VPN client empty iPhone do not ask me for the password. EDIT: One more thing: Is it correct to use "Local Subnet: none" in Phase 2?! Also do the user really not need the XAuth rights?! I think it is a lot easier to troubleshoot things when you break them down into clearly defined steps and deal with them one by one. In this case the whole process can be split into following steps: IKE phase 1, Xauth and IKE phase 2. IKE phase 1's purpose is to establish a secure authenticated communication channel by using the Diffie–Hellman key exchange algorithm to generate a shared secret key to encrypt further IKE communications. This negotiation results in one single bi-directional ISAKMP Security Association (SA). Xauth is an IKE extension that occurs after phase 1 and adds a login/password authentication. This solves half of the authentication problem: because Xauth occurs just after phase 1, it is secured by phase 1 authentication. 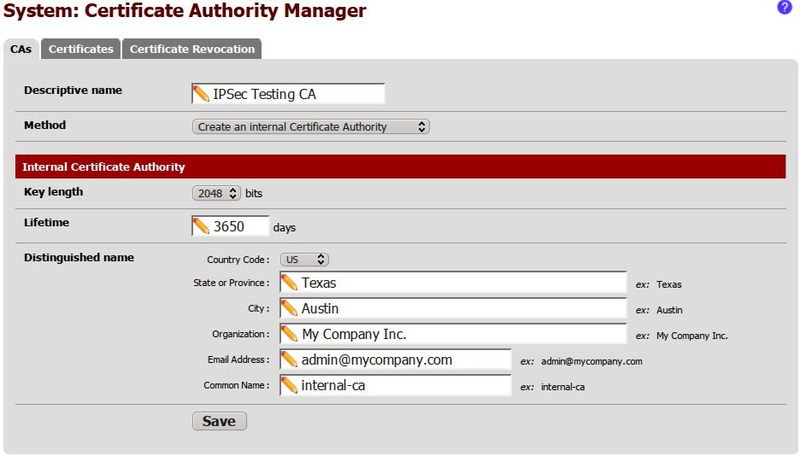 During IKE phase 2, the IKE peers use the secure channel established in Phase 1 to negotiate Security Associations on behalf of other services like IPsec. The negotiation results in a minimum of two unidirectional security associations (one inbound and one outbound). Following is the log of successful VPN tunnel establishment. This is using configuration described in the first step. Road warrior client IP is 192.168.100.140. Mar 12 18:46:42 pfsense racoon: INFO: begin Identity Protection mode. Mar 12 18:46:42 pfsense racoon: INFO: Adding xauth VID payload. Mar 12 18:46:42 pfsense racoon: INFO: Adding remote and local NAT-D payloads. Mar 12 18:46:51 pfsense racoon: INFO: login succeeded for user "IPSecTestUser"
Mar 12 18:46:51 pfsense racoon: ERROR: Cannot open "/etc/motd"
As you can see your connection is failing even before phase 1 is established so make sure that connection between client and server is reliable, check your firewall, ports 500 and 4500 must be open, check and then re-check your phase 1 configuration. Also try disabling NAT traversal and see if that makes any difference. I will post same log as above, but in debug mode in a separate post so you have a reference point. Regarding the local network: setup as described in the first post will force all traffic from the client device to be routed via VPN tunnel, if you want VPN to be used only for the traffic destined to certain network you can specify it in 'Local Network' section of phase 2 in combination with 'Provide a list of accessible networks to clients' setting on 'Mobile clients' tab. I hope this helps you to troubleshoot your problem. racoon: DEBUG: an acceptable proposal found. 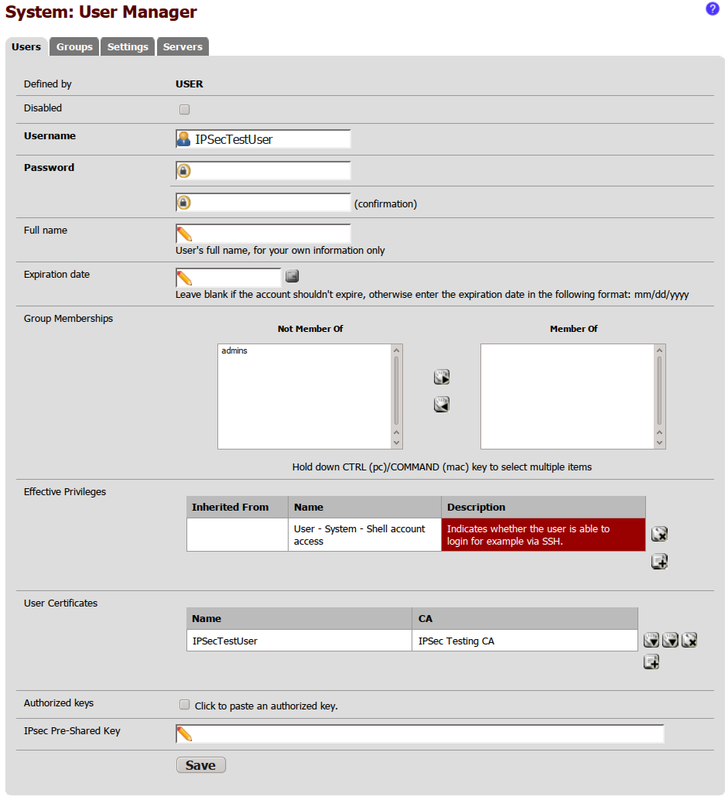 racoon: DEBUG: agreed on XAuth RSASIG server auth. racoon: INFO: Adding xauth VID payload. racoon: DEBUG: compute DH's private. racoon: DEBUG: compute DH's public. racoon: DEBUG: compute DH's shared. racoon: DEBUG: decrypted payload, but not trimed. racoon: DEBUG: skip to trim padding. racoon: [192.168.100.140] DEBUG: getrmconf_by_ph1: remote 192.168.100.140, identity C=US, ST=Texas, L=Austin, O=My Company Inc. /emailAddress=admin@mycompany.com, CN=IPSecTestUser. racoon: [192.168.100.140] DEBUG: configuration "anonymous" selected. racoon: DEBUG: sendto mode config attr. racoon: INFO: login succeeded for user "IPSecTestUser"
racoon: ERROR: Cannot open "/etc/motd"
racoon: DEBUG: Either family (2 - 2), types (1 - 0) of ID from initiator differ or matching sainfo has no id_i defined for the peer. Not filling iph2->sa_src and iph2->sa_dst. racoon: DEBUG: life duration was in TLV. Had to split this in two since the post was too large. racoon: DEBUG: begin compare proposals. racoon: DEBUG: pfkey getspi sent. racoon: DEBUG: generating K1...K4 for KEYMAT. racoon: DEBUG: pfkey update sent. racoon: DEBUG: pfkey add sent. racoon: DEBUG: pfkey spdupdate2(inbound) sent. racoon: DEBUG: pfkey spdupdate2(outbound) sent. racoon: DEBUG: this policy did not exist for removal: "192.168.200.1/32 0.0.0.0/0 proto=any dir=in"
racoon: DEBUG: this policy did not exist for removal: "0.0.0.0/0 192.168.200.1/32 proto=any dir=out"
racoon: DEBUG: suitable outbound SP found: 0.0.0.0/0 192.168.200.1/32 proto=any dir=out. racoon: DEBUG: suitable inbound SP found: 192.168.200.1/32 0.0.0.0/0 proto=any dir=in. racoon: [192.168.100.140] DEBUG: no remote configuration found. racoon: ERROR: no configuration found for 192.168.100.140.
racoon: DEBUG: sendto Information notify. racoon: [192.168.100.140] DEBUG: rescheduling send_r_u (5). I triple checked ALL settings - they are exact the same as yours. Perhaps it makes a difference because I use two CAs and also have several other IPsec BOVPN tunnels?!? ??? Thanks again for your patience and help! Mar 13 11:34:42 	racoon: INFO: Adding remote and local NAT-D payloads. Mar 13 11:34:41 	racoon: INFO: Adding xauth VID payload. Mar 13 11:34:41 	racoon: INFO: begin Identity Protection mode. EDIT: The error above is gone since I changed the server-certificate to use IP instead of domain name. I still run in phase1 timeout without any other error. Disable NAT traversal and check if that makes any difference. I suggest also adding these step-by-step docs to the PfSense wiki. I just tried it with another iPhone (same model / same iOS Version / same modem version) and there it works like a charm! On this second iPhone it works with 3G and also direct out of the company networks WLAN. On my iPhone WLAN and 3G doesn't work. So it must have something to do with my iPhone. But I have no idea what this can be! ??? OK - I think I know the problem now. I found other guys on the internet who have VPN problems like me (timeout) after untethered jailbreak of iOS 5.01 - and that's the big difference between my iPhone and the other one. Just to make clear: I have a neverlocked iPhone direct from Apple-Store and use the jailbreak for IT related software which is not available in AppStore (e.g. SSH). So i never hacked baseband or something like that. But it seems that the untethered jailbreak itself breaks VPN functions! If you are talking about the message 'VPN Connection' with buttons OK and disconnect that iOS shows after connection is established then I don't think there is a way to disable that. Thanks for the guide using it and iphone Configuration utility I was able to setup my iphone with VPN on demand, which is a slick feature with one issue. I can not figure out how to make it save my password. Everytime I connect to the VPN it prompts for the user password. It appears if you create the VPN connection on the phone manually via this guide it will save the user password, however if you do it via the iphone configuration utility I do not see a way to save the password. Sweet will give that a shot this info. Odd that if the configs support such a feature that the tool would not have the interface to use it. Course Apple is known for lack of options. Odd that if the configs support such a feature that the tool would not have the interface to use it. Course Apple is known for lack of options. Well there are ways they could encrypt the password to at least make it more difficult to see. This did not seem to work. I assume after I edit the file I open the file with iphone configurator to load it on the iphone. You need to email the mobileconfig file to your phone and install it via the email on the phone. Success.